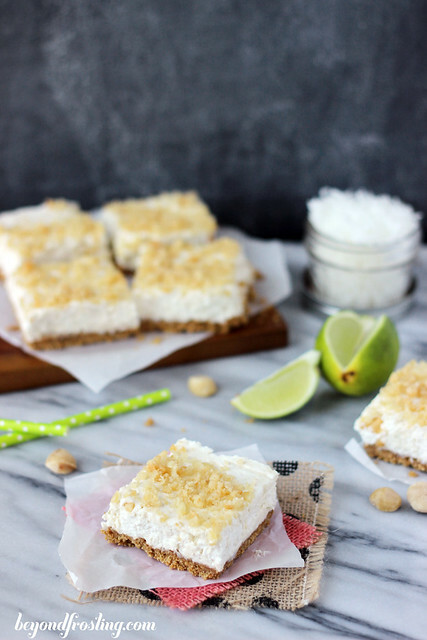 A coconut and lime filled cheesecake bar with a buttery graham cracker crust. Today is National Cheesecake Day! SAY WHAT?! Yes! National cheesecake day. Out of all the food holidays that do exist, this one hold a special place in my heart. I am cheesecake obsessed. It’s one of those desserts that I only allow myself to eat on rare and special occasions. Mostly because they are so loaded with calories. #sorryimnotsorry. Here’s the thing. I have no idea how to actually make a cheesecake at home. Sure, I can follow a recipe, and that is what I did. This past weekend, I successfully made my first homemade cheesecake (following a recipe of course). I was all intimidated by the water bath, but let’s be serious, there is no reason to be afraid of it. I did consult my BBF (best blogging friend) Lindsey for her cheesecake wisdom. That girl bakes one mean cheesecake. Now I am all ready to make cheesecake everyday! 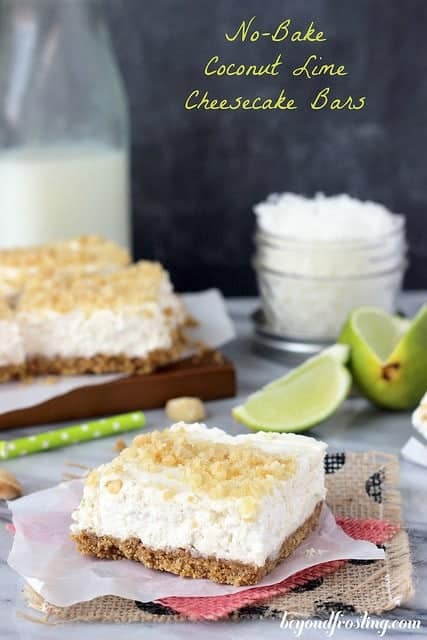 However, today, for National Cheesecake Day I am sharing my favorite kind of cheesecake, the no-bake kind. 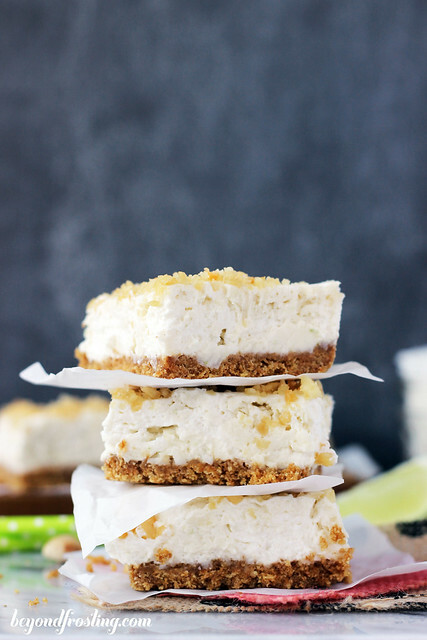 I’ve got a few different no-bake cheesecake recipes on my blog, and this is right up there in my top 3 favorites. 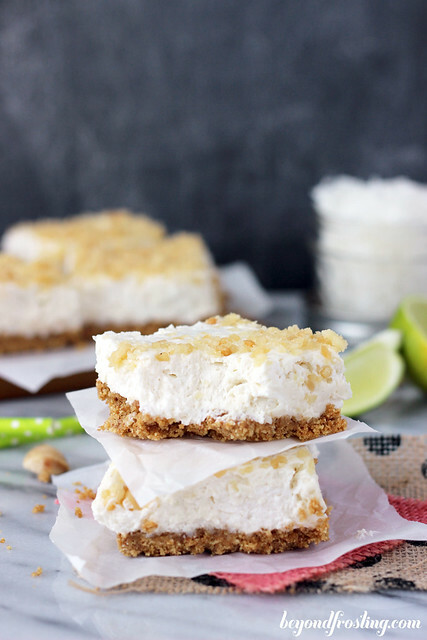 These No-bake Coconut Lime Cheesecake Bars are so light and smooth it almost tastes like mousse. The filling is a combination of homemade whipped cream, a hint of brown sugar, zested limes and flaked coconut. 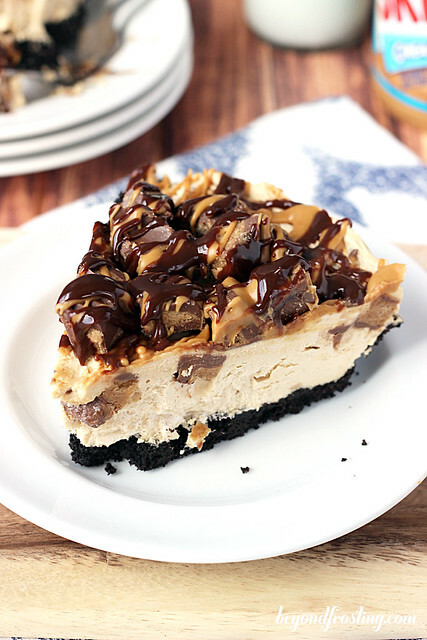 All of these things are combined with a graham cracker crust to create one of those desserts I would categorize as “hard to resist”. As in, get them out of my house before I eat the whole pan myself. 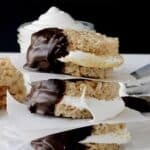 I learned after making my Coconut Cream Pie Cookies that homemade whipped creams helps to create the most tasty mousse texture. Of course, you can substitute Cool Whip instead, and I am a fan of Cool Whip. However, I wanted to try something different with these bars, and I am so glad I did. These bars remind me of my trip to Miami in May. I had my first key lime pie, which tasted much like a cheesecake. The only thing that makes these bar not “key lime” is that I can’t usually find key limes in my area. So I use regular limes instead. These bars are sprinkled with a little macadamia nut because why not? Feel free to dive right into this pan, after you let them set for a couple of hours of course. If you need me, you can find me eating a piece of cheesecake, it’s a national holiday after all! 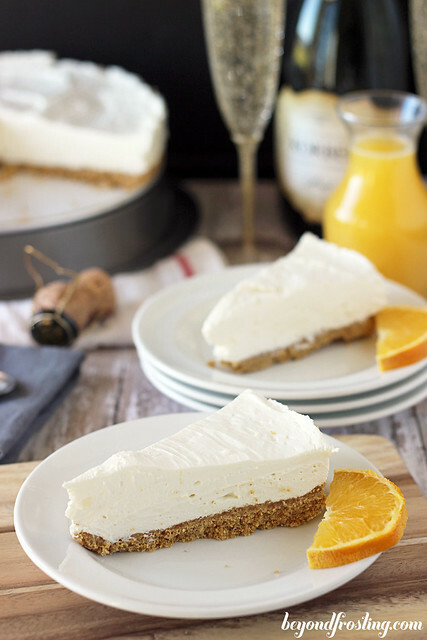 Be sure to check out what everyone else is making for National Cheesecake Day. See below! Don’t forget to save your favorite recipes to your recipe box with the button! You can create a meal plan and a shopping list all in the same place! Prepare the crust by grinding the graham crackers into a fine crumb. Combine with brown sugar. Melt butter (6 tbsp) in a microwave safe bowl and pour over graham cracker crumbs. Add corn syrup. Stir until graham cracker crumbs are fully coated. If still dry, add 1 more tablespoon of melted butter. Gently press crust into a 9×13” pan. Set aside. 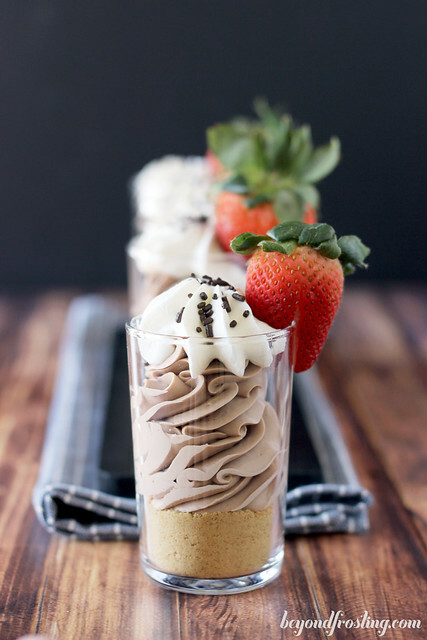 To prepare the filling, make the whipped cream. Combine heavy whipping cream with powdered sugar. Whip with the wire whisk attachment on medium-high until stuff peaks form. Refrigerate to keep cold. Beat cream cheese and brown sugar on medium-high speed for 2-3 minutes. Add heavy cream and beat on high for another 2 minutes. Add coconut extract and zest in the limes. Squeeze the juice of half a lime into the cream cheese mixture. Beat into cream cheese until well mixed. Add shredded coconut and beat to combine. Remove the whipped cream from the refrigerator and gently fold into the cream cheese mixture until mixed. Take care so as not to deflate the whipped cream. Pour over crust and spread with a knife to distribute evenly. Use a food processor to grind macadamia nuts into crumbs. Sprinkle over top of the bars. Refrigerate for 2-4 hours. Keep refrigerated. 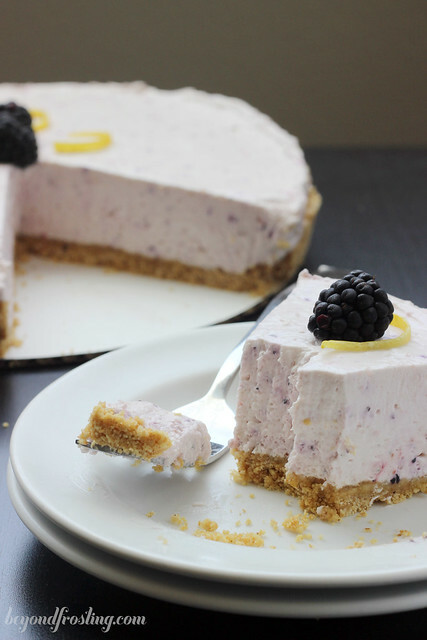 Blackberry Cheesecake from You Made That?